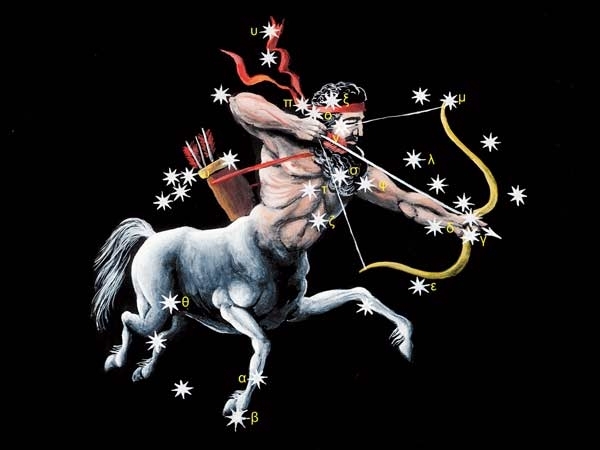 Sagittarius is the ninth astrological sign in the zodiac, which spans the zodiac between the 240th and 270th degree of celestial longitude. In Sidereal astrology, the sun currently transits the constellation of Scorpio from December 16th to January 14th. The sign is symbolized by an Archer. The characteristic of an Archer as symbolized in Sagittarians, is a person with a stretched arrow ready to fight for a cause, traditions and principals. Characteristics of Zodiac sign- Sagittarius. Sagittarius is a Male, Fiery and Dual sign. Being a male sign, we see traits of courageous, egotism ,enterprising and ambitious with a strong physique. Being a dual sign, makes them difficult to decide or take risks for themselves. But, as it is ruled by Jupiter they can be very good advisors and take decisions for others. Being fiery, makes them ambitious, courageous, firm, egoistic, volatile, intolerant of contradiction and fixed to their opinion. Being a rashi of Dharma trikone, makes them religious and fights for tradition and values. As it is in 9th house of natural zodiac, the house of luck, fame, tradition and God, makes them pious, knowledgeable, wise, excellent advisors, excellent teachers, famous and good followers of people. Lord of Sagittarius is Jupiter which makes the person magnanimous, priest, upholder of tradition, wise and conscientious. Sagittarius rules thighs and fat tissue. Qualities in patients for homoeopathic prescribing. In a chart, whose ascendant is Sagittarius or Moon is in Sagittarius or Jupiter is in Sagittarius, the above qualities would be more prominent .